Our 2018 is coming to a close very soon. Where did the year go?! Filled with memorable days with many of you, & for others not enough time together. Our travels started with a February trip to Louisville, KY where we went to the “show of shows” for military & gun collectors. Foodie joints, the Louisville Slugger tour, & downtown were a part of the trip. Dean & I visited the St. Meinrad Archabbey. The architecture & gardens are stunning. Mother’s Day weekend included a combined mothers trip to Pella, IA to view the late spring tulips, a windmill tour, & indulge in Dutch fare. Memorial Day weekend Dean & I visited the Lincoln Museum & Home in Springfield, IL. Late June, we gathered up my Rachel’s three, & took a 4-day trip to Branson, MO where the go-carts reigned. Such fun with the grandkids! We had a short few days in Minnesota. It definitely was not long enough, but happy to relax & visit with in-law family in the Twin Cities and family friends on Island Lake part of the 4th of July week. Over Veteran’s Day weekend, we holiday & antique shopped in Branson. Our grandchildren continue to flourish. Dean’s granddaughter, 2-year old Elise has developed into her own person. Loves art, music, & hands-on anything! My youngest grandchild, Eli shines in math & finally had a buddy move in his neighborhood. Ella needs to stop growing! Such a kind, pretty young lady she is. My oldest granddaughter, Hannah, is in her last year of homeschooling. Another artsy one. The last I heard she wants to be a tattoo artist, but had thoughts about nursing. Either or both paths are the right one for her. I understand that pull in vocational choices based on gift areas. Libby is thriving in her 1st year of high school, active with choir, & quite the artist as well. What is it about our girls & art? My Brendan is the other one that needs to stop growing! He excels in his height along with sports & academics. Our beloved, Midnight passed away in June just before Father’s Day. The memories we had with him during his puppy, young & older adult doggy years I will treasure forever. Dean & I had him his last 5 years after my father passed away. Though I hesitated at the first, Dean embraced being Midnight’s new master when the need was brought to our attention. This Labrador brought so much liveliness & love to our home & our extended family. We miss our Midnight. Another doggy will come into our home later, maybe when we retire. Our feline, Celine stays at the St. Peters house. She is getting too old for another change. We have granddogs & grandcats always in plenty. The growing season was shorter this year. This spring I missed the window of opportunity to sow my greens like arugula, lettuce, & spinach because it was winter up until mid-May. Summer came 2 weeks later! In our screen house we again had monster tomato plants produce some delicious cherry tomatoes. I still have a few of those green tomatoes picked before Jack Frost came that are turning red in a bowl set in the kitchen window. Boone Hollow Farm where the screenhouse/greenhouse seats is still a serene place for Dean & myself to hide away during a workweek evening or weekend. Just 30 minutes of the country quiet & picking weeds or vegetables can restore my blood pressure & sanity to normal. Dean continues to serve & learn from the clients that come into the research room at the National Archives. The stories the researchers & employees uncover are quite entertaining. Throughout the year we go out for happy hours or dinners with his clients. My work with the employee wellness program at St. Louis County was nationally recognized by the American Heart Association this year, after 10 years of creative efforts & hard work. In 2019, I along with other wellness professionals in the St. Louis region will address diabetes & glucose issues. I can personally vouch that regular physical activity keeps those numbers in line. I was walking 10,000 steps a day this year, & am now challenged by the cold temps. Our basement will be put into use over the winter months just like the underground tunnel at work. Advent season sets the stage of waiting in hope & a readiness for the Gift. The Gift of Jesus is there to embrace any day & any time. Our hopes are birthed in Him. One of our children has a hope for healing of chronic health conditions of degenerative disc disease & arachnoiditis against the current medical odds. Conventional medicine has harmed more than helped, so alternative therapies are sought for pain management. Missouri joins the legalization of marijuana, a miracle in itself. Another one of our children is waiting & has a hope for having a child. Dean & I continue to pray for our daughters & sons. And for each of us who have a hope whether tiny or big, impregnate our whole being, let the joy of knowing that our God reigns, He cares, He loves us right now just as we are. Look to Him for security. “Hope as an anchor” is what I pray for you & our loved ones this holiday season & long into 2019! The “Christmas Trees For Sale” sign in the store front window caught my attention. Fresh pine scent, the friendly “howdy” greeting, footsteps on the squeaky wood-planked floor, and the jingle of the door bells as I enter and close the door into the little gift shop … each liven my senses … bring me to back when. A little pony-tailed blonde-haired girl. Cannot wait for the holiday season, Thanksgiving, Christmas Day, and New Years. But all the events leading to those wonder-filled holidays. Baking, decorating, crafting, wrapping, and for me living on a tree farm, setting up the pine trees to sell. Always Thanksgiving weekend my Dad and Grandpa brought in a truck and trailer overflowed with fresh cut Christmas trees. Scotch pine, white pine, and spruce trees planted, trimmed, and cared for by Dad, and any family members looking for some extra $$ pitched in. My siblings and I included. We would play hide-n-seek in the pile of cut trees until there were no more to set-up. Snow, ice, or rain, it did not matter. Wholesome fun. We had the time of our lives back when. A weekend away in Branson, Missouri for early Christmas shopping and a membership inquiry with a vacation club for more of these empty nest long weekends and longer week dream vacations. Dean and I are local shoppers, whether in our home town of St. Charles, Missouri or while on vacation. There is something down-to-earth about brick & mortar and mom & pop shops. Branson has the downtown landing and tourist attractions, but take us where the locals shop, eat, and play, please! Nostalgic Dicks 5 & 10, Main Street Flea Market, the Classy Flea, and the Farmhouse Restaurant … Back when the Nativity was in every shop, home, and city hall. The holidays included real pine rope trimmings with bright red velvet bow wreaths and pine cones. Back when that fresh field-cut Charlie Brown tree was dressed with hand-sewn ornaments, Shiny Brite glass balls, and a collection of heirloom from Germany or England, wherever your family originated from. Back when home-baked breads were served at every meal with a home-jarred fruit preserves, and your favorite sugar cookies piled on a plate or in a large jar for the eating any time. But not too close to your mother’s or grandmother’s home-cooked dinner, “not to spoil your appetite”. The house smelled of a fresh pot of chicken & dumplings. I imagine my father’s Christmases in the 1940’s. Filled with joy to have his father, my Grandpa Earl back home from the war. Grandma Anna doting over the menu preparations. Two or three simply wrapped presents with his name “Marty” on the tags under the tinseled Christmas tree. Back when is close to my heart at this present moment in the guest bedroom of our 1940’s house. My family has been blessed with fond memories and we will make more. Our bromeliads need to be divided as they had been quite busy this past year producing babies. A bay window in shallow terra-cotta pots had been their home. Showy fuchsia edges contrast with the fresh green, these babies needed new homes as they were crowding their parents. Dean and I carted two plants with us to our July Minnesota destination. The bromeliads stayed outside near the cabin and lake for a few days. When the storms brewed up, we brought them onto the screened porch. We hoped these showy plants were accumulated to their new surroundings, when we spent an afternoon dividing and repotting them. Five planters were made and given to our northern friends. We hope these tropical plants enjoy their new homes. We brought to our Missouri home gifts of heirloom tomato plants and streptacarpella, which have thrived well this past month. These tomato plants should produce fruit well into the winter months in the comforts of our semi-heated garage. And maybe the purple-flowering streptacarpella will find their home in window planters in the spring. We are cleaning out that garage this month, finding new homes for bikes, toys, old furniture, and throwing away those “why did we keep this?” stuff. Our lawnmower and garden tools will go into their new home, a shed built in our back yard this week. We are making room for our beloved plants as the air changed this week. In about 6 – 8 weeks, our planters landscaping the yard this summer will be in their winter home, inside the heated garage under plant lights before the first frost of the autumn season. Dean and I dream of a new home for just the two of us. The place we call ours, some where between St. Charles and Hermann along the Missouri River and the wine valley. If I chose, retirement from my office job is only 5 years away. But not retirement from living. So much more to experience. See what adventures come as we seek and find God’s will in this approaching season. Wherever we go, green things, art, and hospitality come with. “Herbs deserve to be used much more liberally,” quoting food writer and chef, Yotam Ottolenghi. I keep telling my friends, family, and co-workers the marvelous benefits of herbs. Bursting flavor and full of nutrition! I recently found this guide, the ANDI guide which rates foods based on nutrient density. My ravings on herbs are justified according to ANDI. ANDI stands for “Aggregate Nutrient Density Index,” a scoring system that rates foods on a scale from 1 to 1000 based on nutrient content. ANDI scores are calculated by evaluating an extensive range of micronutrients, including vitamins, minerals, phytochemicals and antioxidant capacities. Here is a list of basic herbs and their scores to illustrate this concept. Basil rated the highest of all the herbs! 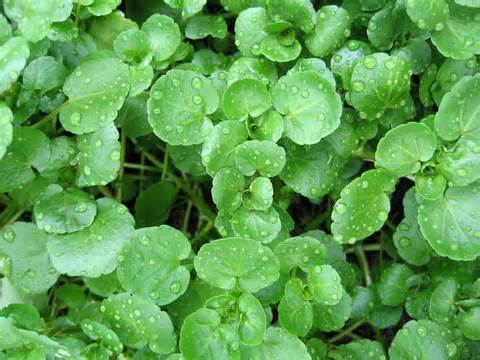 Such an easy herb to grow in terra cotta pots in the kitchen window sill or in a sunny garden spot. Our bed of herbs in the screenhouse of our greenhouse include a few varieties of basil. Genovese, lemon, and Tai to name three. In the heat of the summer, it is prolific! Basil nutrients rate up there with arugula, leaf lettuce, and radishes. It’s about 50% the value of superfoods kale and garden cress, but 4 or 5 times more than soybeans or pinto beans. The Italian and Mediterranean cultures include basil in many of their recipes as well as Thai and Mexican cultures. Where I live and work in the St. Louis, Missouri region, there is an Italian restaurant or pizzeria on every corner of the block and in between. We love our pasta and pizza! My home kitchen has the flavors of Italy with my own fresh homegrown basil. Cost pennies to grow. Last night I made homemade pizza with a cup of fresh Genovese basil leaves cut into strips and atop tomato sauce, Italian sausage, Canadian bacon, garlic and black olives. Sometimes its a veggie pizza, with chunky tomatoes, mushrooms, bell peppers, spinach, arugula, black olives, etc. You know, the plumposity of veggies in a single slice of pizza pie! Then there’s pesto! It’s flavor tastes how the word sounds when you say it. PEST-O! More flavors to discover in this nutrient dense herb … sweet, lemon, Tai, spicy, lime, Genovese, cinnamon, anise. 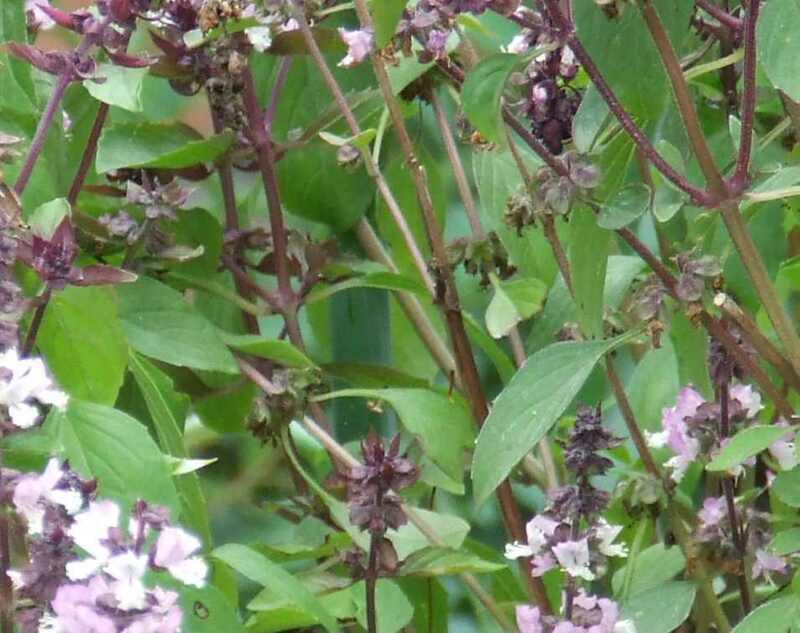 Cannot wait to make some lemon scones with the lemon basil this weekend. What herb has captured your taste buds? Hot herbal cinnamon tea greets my Tuesday afternoon break at the office. The AC is working overtime this humid July day. Tuesday’s and Wednesday’s thoughts go to Dean and I’s house hunt. We met some monumental financial goals this year with hopes of a simply charming home to call “our own” before year end. It is interesting to view other people’s homes, thinking of the history lived in them. We desire a home built over 50 years ago, when quality reigned. Large is not necessary. Quaintness is. This quest to turn an antiquated house into a picturesque home is exciting. Old Town St. Charles has been in our thoughts, but open to other neighborhoods in the St. Louis area. We would like a yard large enough to occupy our Labrador retriever, Midnight when he is outdoors. Our green plant friends such as flowers, herbs, and vegetables are quintessential to our life, so space for them is paramount. What does “quaint” look like to you? 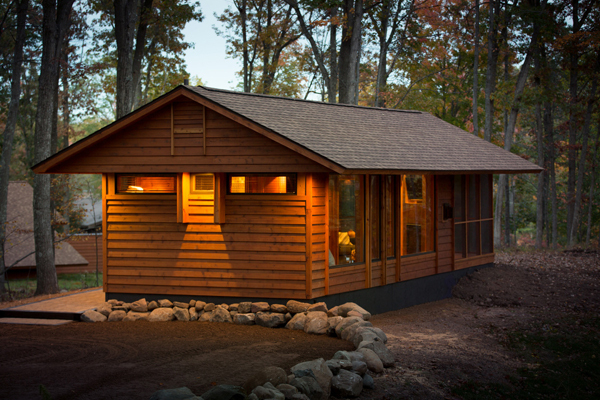 So how about this “Escape Cabin” designed by architect/artist Kelly Davis? This might work when Dean & I are ready to retire! A Nosh, Dish, Bowl or Plate? As a personal chef by nature I wonder if I should name my summer time culinary creations a nosh, dish, bowl, or plate. I improvise when I cook in my kitchen. With the ingredients in hand from the garden or farmer’s market, they make way for creativity. A casual menu on a whim. This summer my herbs climb with the summer humidity. My chicken risotto served in individual bowls one weekend was laced with a leafy green herb Dean brought home from the greenhouse. It had a spicy bite to it unknown to be parsley as I had thought it might be by its look. When returning to the greenhouse mid-week for watering, I discovered on the garden sign it was watercress added to Sunday’s risotto bowl. 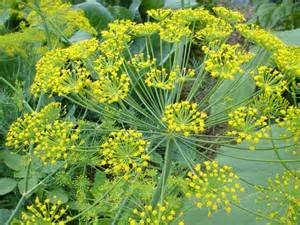 I had never grown or cooked with this newly discovered herb before, and it paired deliciously with the farm fresh eggs for egg salad on dollar rolls last night. I hear it is the new kale in the farm-to-table culinary world. Just 1 cup of chopped water cress is power-packed with potassium and vitamins A & C. There are only 4 calories in 1 cup of chopped watercress. Calorie breakdown: 8% fat, 42% carbs, 50% protein. Oh, the flavors burst, so it goes a long way! Fresh sprigs of dill were snipped into the red potato-celery salad. This week a spare bottle of local summer ale went into the crockpot with the turkey breast sprinkled with lemon pepper from the Olde Town Spice Shoppe, slow-cooked for 10 hours. Succulent! Accompanied with farm fresh, roasted yellow beets, red potatoes, and carrots in a bowl! The leftover turkey breast had filled a casserole dish of enchiladas another night. When I cook, I cook for 2 or 3 meals, using one dish to accent another. Rarely does food go to waste in my home. That stock left from the turkey breast is put into the freezer and will make another risotto another rainy night. Tonight it is small plates of Three-Cheese Italian Herb-Veggie Foccocia and Italian Breaded Chicken Tenderloins. What nosh, dish, bowl, or plate are you making tonight with your garden fresh ingredients? Hot tea has been the beverage of premium choice for the 3+ long months of winter. Wild cherry is my favorite, seems to cure whatever may ail my body. Then there is the tea garden green or pomegranante green tea that brings a bit of spring or summer into my day, healing to my mind. Of course, the classic Earl Grey with a tad of half & half brings me to my days as a young mother. My sister-in-law introduced me to this tea after spending a year in England. The more contemporary, spicy, citrusy flavor of Chai filled my tea cup several times as well this winter. 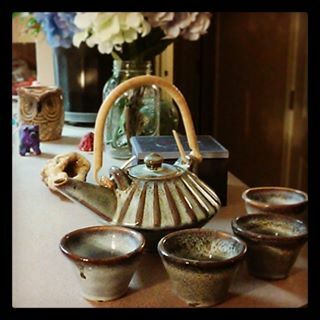 The tea set in the photo is a gift to my daughter, Elisabeth who celebrated her 30-year birthday a few days ago. I want to share my love for tea. It can change the tone of a day after a few sips. It must be taking those few moments to savor that saves the day. The mentioned teas and tea set are all compliments to the Olde Town Spice Shoppe in historic St. Charles, a local small shop for all your teas, accessories, spices, and gourmet foodie items. Spring visits Missouri again this week, and a spot of tea does not quite fit the bill. 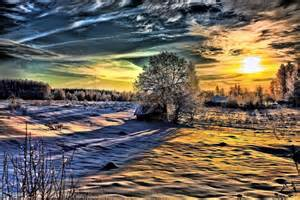 I make a change with the temperature of the day. It is a celebration drink with the good news. My bloodwork showed no auto-immune or cancer! Just an allergy to the cold, which this winter was the worst for me since this allergy appeared over 5 years ago. 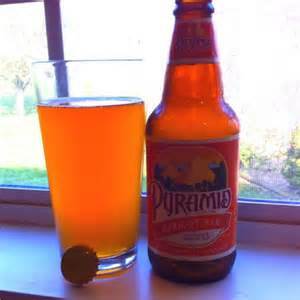 Pyrmid apricot ale is poured into a clear glass, sharing the bottle with my hubby as I am feeling a bit woozy-headed and tired this evening. The apricot ale pairs wonderfully with the sweet chili Thai noodles with sweet peas and grilled chicken. I think this ale would accompany a dark chocolate dessert very nicely. My Weight Watchers weigh-in is tomorrow, better hold off for another day when I feel up to baking and can work off the extra calories (or points) before weigh-in. I sip a cinnamon vanilla herbal tea as I write. What is your choice of beverage? And what food do you pair it with? I would love to hear! Rain, rain, and more rain! We need it so. The plant life is saying “ahhhh!”. After such a lovely weekend, the most beautiful for Missouri that I have experienced in many, many months! And I hear we will have another one this upcoming weekend. I took last weekend off from working at the spice shoppe to enjoy the weekend with my kids and grandkids. My oldest daughter and my chef son-in-law bought a 100-year old house full of history and character in Farmington, Missouri about an hour and 45 minutes south from us. My granddaughters, Hannah and Ella helped in making some planters using kingston ferns, hibiscus, asparagus ferns, and succulents as house warming gifts. The planters bring life to their wrap-around porch, well more life. The kids do plenty of that, too! The planters will warm their house when the air gets cool, and the summer warmth will follow into their new home. Suddenly, Dean & I’s house is empty! After 7 people living in a modest 3-bedroom home for 9-months, the house is in need of deep, deep cleaning. We are determined to conquer 1 room each week for the next 6 weeks, carpet and upholstery cleaning this evening, with wall washing, dusting, and shining the windows in the living room later in the week. We will rearrange the furniture for a pleasant change. After the deep cleaning, a fresh coat of paint will liven the rooms again. Soft hues on the walls with sparkles swirled into ceilings. Cannot wait. Autumn’s arrival will bring our houseplants and tropicals back into our home after growing taller and fuller in our landscape this summer. Their lovely green leaves will bring a nice contrast to the walls and wood furniture. 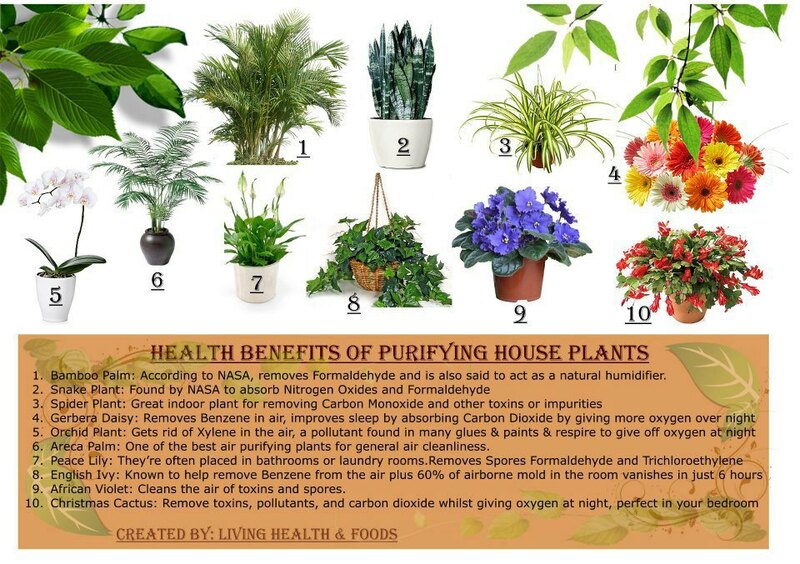 So what are some of the benefits of having house plants? Plenty. See below. Contact Deanna Greens And Garden Art for your houseplant needs! What do all these have in common? M’waw! In any given 15-hour period I can be all four places: historical small town main street, bustling city streets, tree-deprived urban avenue, or a country dirt road. The brick road, Main Street Missouri’s first state capitol of St. Charles, global skyscrapers towering over financial hub Clayton, urban neighborhoods sprinkled throughout St. Charles and St. Louis Counties, and the countryside near Defiance’s howling coyotes and wildlife; each culture is within 15 miles from my home. Today, the contrasting changes were apparent to me. Sunday, I spent 8 hours on Main Street in St. Charles, Missouri selling herbs, spices, and other food items at a niche market with literally hundreds of people during the Festival of the Little Hills, shopping at leisure and a slower pace. Early Monday morning I entered into a landscape of skyscrapers after bumper to bumper traffic at the fast pace of a city freeway. Suburbia is entered on several occasions as I get off the freeway as soon as I am able, finding quieter routes through residential areas and strip malls. And then to the greenhouse, winding down as I go out of the city, then suburbia, onto a state highway, county highway, and finally taking the dirt road near the weathered barn up the hill to our greenhouse. Most evenings we hear the owl’s hoot and the coyotes howl. Currently, I co-exist in these four cultures. Though two of them I am most at home with. Guess which two? Adaptability and flexibility have been engrained into my character these past five years while working for St. Louis County Government. Will I thrive for another 11 – 12 years in the city and its commute? Or is small town main street calling us home? More words on that subject at another time. Praying to see what God has in mind for Dean and I these last years before retirement.